We spent over 35 hours researching and testing more than 20 different types of dog treats and found that quality ingredients, value for the money, and secondary benefits were the most important factors for consumers who were shopping for dog treats. 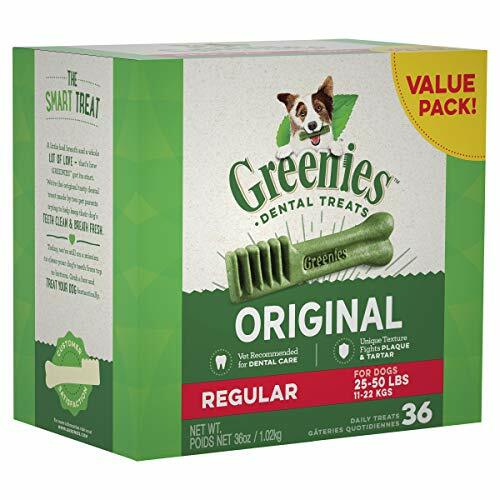 Greenies Dog Dental Chews Dog Treats scored high marks in all categories and is our overall top pick. These unique dog treats help improve your dog’s dental health by fighting tartar buildup and plaque and improves your dog’s breath as well. These veterinarian-recommended dog treats are made from easy-to-digest, natural ingredients that will add to the overall nutrition your dog gets every day. One of the best things you can do for your fur baby is give him or her healthy dog treats in addition to a well-rounded, healthy diet. There are tons of different dog treats on the market but not all dog treats are created equally. There are quality, healthy treats and treats that are made with nothing but fillers and less than healthy ingredients that you should not give your dog. With all of the different choices on the market it can quickly become overwhelming trying to figure out which are the right treats to give your dog and which ones you should pass over. There are some dog treats that can cause allergic reactions due to the ingredients so ensuring that you are choosing a treat that is made from natural ingredients is much healthier and safer for your pooch. The good news is that if you stick to the recommended daily allotment of no more than 10% of your dog’s daily nutritional intake in the form of treats, you won’t have to worry too much about what is in them, but you should still be aware of the ingredients you are feeding to your dog for the maximum safety and health benefits. We have listed and reviewed the three top-rated dog treats on the market according to our extensive research so you can learn more about these popular options. All three of these selections are healthy and made from ingredients that are good for your dog. In addition to these reviews we have included a buying guide that contains valuable information about what to look for in a dog treat and how to sort through the dozens of choices available so your dog gets the most out of getting these treats. First on our list is Greenies Dog Dental Chews. These natural dog treats provide more than just something great to eat; they improve your dog’s dental health by cleaning their teeth all the way down to their gumline, fighting tartar and plaque buildup and freshening their breath in the process. These veterinarian-recommended dog treats are also accepted by the VOHC; Veterinary Oral Health Council, as safe and beneficial for your dog so you don’t have to worry that you are not giving them something healthy and safe. The easy-to-digest ingredients used in Greenies makes them a nutritionally complete dog treat that will please your pet while helping them have healthier gums, teeth, and pleasant breath too. Greenies are available in a variety of sizes that you can choose from based on the size and weight of your dog. Since they are made from healthy ingredients your dog can enjoy Greenies every day without worry. 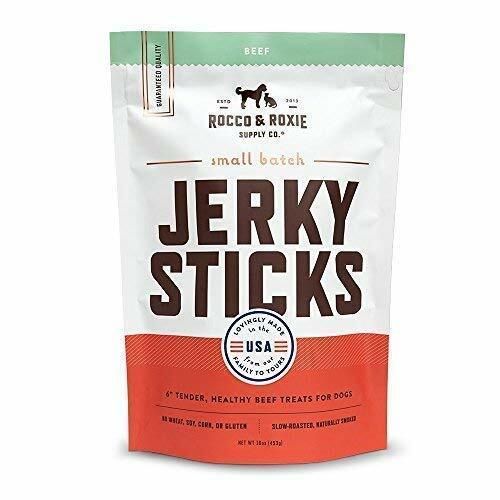 If you are looking for a treat your dog will love while providing them with something healthy to boot, Rocco and Roxie Gourmet Jerky dog treats are just what you’re looking for. These delicious, dog-preferred jerky treats are made from all-natural ingredients and have a chewy texture dogs love. Ingredients include real turkey, beef, or chicken. There is no corn, soy, artificial flavorings, or gluten in these healthy treats so you never have to worry about allowing your dog to enjoy them on a regular basis. Each of these treats is made from real beef that has been smoked for over 10 hours to provide a chewy, enjoyable treat your dog will go nuts for. They are perfect for training and have been found to be a real motivator for good behavior. Unlike some lesser quality treats on the market, Rocco and Roxie will not leave an unpleasant odor or residue on your hands. In fact, they smell and feel like real jerky so much you made be tempted to try it yourself! These quality jerky dog treats are backed by a 100% satisfaction guarantee. 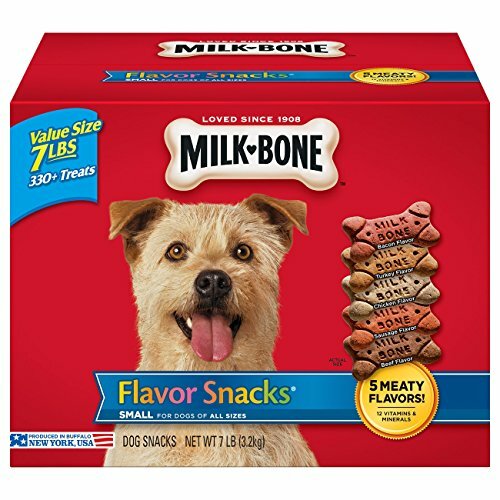 One of the most well-known and loved dog treats around is Milk-Bone dog treats. These delicious, crunchy, bone-shaped treats have been around for decades and are still one of the best and most popular dog treats on the market. These milk-bone flavor snacks are available in five different flavors that your dog will love. Along with being tasty and appealing to dogs, these crunchy treats are fortified with 12 vitamins and minerals that are beneficial to your dog’s health and well-being. They are great for training and can become an adored part of any routine for your dog. Many dog owners give their dog a Milk-Bone dog treat before bed each night, giving the dog something to look forward to and teaching them that their nightly bone means it’s bedtime. Another benefit to these popular dog treats is that they help in keeping your dog’s teeth clean with their crunch texture. Although you should be careful feeding these to a dog that has a lot of allergies, once you determine there are no adverse reactions for your dog, they will quickly become a treat your dog will become obsessed with. These little bone-shaped treats are the perfect size for any dog and come in a variety of amounts that work for any dog owner’s budget. These three top-rated dog treats are all high quality, popular dog treats that provide your dog with enjoyment and extra nutrition as well. They are not a replacement for a well-balanced diet in any way but can enhance an already healthy diet and provide extra benefits as well. Each of the selections we have reviewed above is made from premium ingredients that won’t fill your dog with fillers and ingredients that can hurt them or cause allergies. Each one of these top-rated treats provides an example of a type of dog treat that is on the market so you can see the variety available and decide if any one of them is right for your dog. Once you are ready to purchase a dog treat for your dog, considering one of these top selections is a great place to start. If you don’t see what you’re looking for in these choices, we have added 7 more dog treat selections for you to consider. There are several things you want to consider and look at when shopping around for the best dog treat for your dog. Below, we have listed several things you want to think about during your search so you choose the best dog treat you can for your fur baby. Look at the nutritional facts – Since dog treats are not regulated the same way dog food is, you don’t always know what is in the treats that are on the market. Some companies have no idea what the nutritional breakdown is of their treats including how many calories they have in them. Look for dog treats that know what they have in their treats. This is especially important for dogs that have allergies. If you don’t know what ingredients are in the treat how can you tell if it is safe for your dog? Brand reputation is important – When it comes to healthy, quality dog treats, brand name means a lot. You want to purchase dog treats made from a company that puts nutrition, health, and safety at the top of the list. Choosing a well-known, established company will help add a layer of security and reassurance that the dog treats you are serving your dog are quality treats they can safely enjoy. A good company has standards and quality control that ensures what is being put out there to sell is a quality product and not just something to bring in money. Be careful about pet bakeries – Pet bakeries have grown in popularity and while this trend appeals to those who want to “do something special” for their dog, buying expensive, fancy treats from a bakery doesn’t make them healthier or better than a treat from a well-established company that has been producing healthy dog treats for decades. You also need to be aware of the qualifications of the pet bakery bakers. Do they know about dog nutrition specifically? Do they know everything that is in their treats along with the nutritional breakdown? Are they adhering to safety standards so your dog is safe from treats with spoiled or lesser quality ingredients? Although the concept is cute, getting your treats from one could be another matter entirely. Organic Ingredients – Choosing dog treats that contain organic ingredients is always preferable because they will not typically have contaminants in them. They also get examined by inspectors more closely since there are certain criteria that must be met in order to use organic in the name. The more organic ingredients your dog treats have the better it is. Natural sweeteners – sweeteners are not really necessary but if they are in your dog treats make sure they are natural sweeteners like molasses, honey, or even applesauce. A little bit of these natural sweeteners in a dog treat are okay as long as the dog isn’t getting too many of these treats. Light on preservatives – Look for dog treats that only contain safe preservatives such as vitamin E and C. Vitamin E is usually listed as mixed tocopherols and is a safe preservative for your dog. Preservatives are used primarily for shelf life so if you choose dog treats that have no preservatives stay aware of how these treats need to be stored and use them in a timely manner or they could go bad. The majority of dog treats on the market fall into two main categories: meaty dog treats and crunchy dog treats. We have provided some information about both types below so you understand the differences and features of each. Meaty Style Treats – Meaty treats are not all alike. Depending on the treat, a meaty dog treat can be dried like jerky treats or baked or dehydrated. Meaty treats are going to be higher in animal protein than other types of dog treats. Some ONLY have meat and others might add some other foods that your dog could enjoy. This will vary from company to company. A dog treat that is made with 100% meat is going to cost more than one made with vegetable or grain based products but they are much healthier and better for your dog. All meat treats may not last as long so pay attention to whether the treats you choose have to be refrigerated or not. The ideal thing to look for in a quality meaty treat is one that is made from as few ingredients as possible. The fewer ingredients the meaty dog treat has the better it is for your dog. Cookie Style Treats – The other main type of dog treat you will find on the market is the cookie or biscuit style treat. This type of treat can be formed into a variety of fun dog-appealing shapes like Milk-Bone does with their bone shaped biscuits. Even though some dog cookie type dog treats can be quite large, the smaller pieces are better to prevent frequent choking. Cookie type treats are usually made with grains or other carb and are baked. This is a large category of dog treats and as people have learned more about dogs and their nutritional needs, a lot of grain-free choices have entered the scene. Depending on the company you may find cookie treats that use animal products to “flavor” the meat but will also have salt and sugar in them as well. These treats are not very healthy for your dog and add ingredients that can cause a variety of health problems long term. The same principle applies to cookie style treats that we recommend for the meaty style treats; the fewer amount of ingredients used to make the dog treat the better it is for your dog. There are several things you want to avoid in the ingredient list of your dog treats. It is best for your dog to avoid the following ingredients. Artificial colors – Colors are added to dog treats and dog food to enhance the color and make it look better to dog OWNERS not the dogs themselves. The dog has no concern over what color the treat is only that it tastes good. Artificial colors are just chemicals that are not good for your dog. Artificial preservatives – Artificial preservatives include ingredients like potassium sorbate, BHA, ethoxyquin, sodium nitrate, and BHT. All of these things should be avoided and are not good for your dogs at all. Chemicals – Chemicals like propylene glycol are often used in human and pet food to keep it chewy and moist and to keep preserved meats from discoloring. Molasses and vegetable glycerin are much better choices as preservatives than chemicals that can cause potential health problems. Make sure if there is any glycerin in the dog treats you are considering make sure that it is vegetable glycerin which is a food-sourced glycerin that is much healthier and safer. Dog treats are a great way to train your dog and provides a means of bonding with your dog and creating a routine that your dog can look forward to each day. There are dozens of different dog treats on the market to choose from so if you aren’t sure what you’re looking for, things can get overwhelming pretty quickly. The purpose of this guide and the reviews of the three top-rated dog treats on the market are to help you easily sort through the different treats and choose the one that is the best for your dog’s needs, preferences, and health. With so m any treats on the market, it is far too easy to want to grab the first dog treat you can and go on with your day but not all dog treats are good or even safe for your dog. All three of the top-rated dog treats we have reviewed above are made from natural ingredients that are safe and healthy for your dog to consume. They are made from premium ingredients and come from reputable companies that are known for producing healthy, well-made, natural dog treats. If you are looking for a fast solution for some healthy, quality dog treats for your dog any one of these three dog treat selections are a great choice. The information provided for you in the buying guide helps you understand the ingredients that you should look for as well as those you should avoid. We have also provided tips on what you need to look for in a dog treat and how to spot the ones that are best. All of this information will allow you to make a confident decision on the best dog treats for your dog.